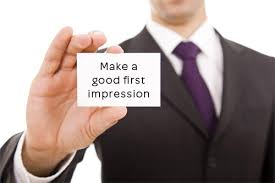 First impression is probably the most important concept in life that is mostly overlooked by many of us. Fortunately for some people, they don't have to try hard to make the right first impression; they are naturally suave, able to engage in conversations easily and are just able to magnetize others. Some people on the other hand fall flat on their faces the moment they meet someone for the first time. Having completed my masters degree, I have been attending a number of networking sessions and picking up tips that have worked for myself and others, and some factors that just destroy the vital first impression factor. Your Appearance is Key: When I was young, I read a statement somewhere that said "when you stand to speak before people, they look at how you are dressed. If they like what they see, they'll listen". These days, so many of us are careless about the way we look. We go out to tattoo our faces, pierce our eyebrows, tongues and all sorts of body decor that may be attractive to our friends, but will scare away potential employers or sponsors. Your appearance is very important if you intend to make the right first impression. Torn jeans, dirty sneakers, baggy tshirts and the likes are perfect for a ball game in the park with the neighborhood kids, not for meetings, interviews or presentations. For ladies, make sure your hair (natural or otherwise) is neat and tidy, don't over-do the makeup, and wear clothes that are stylish, yet conservative. Speak Properly and Confidently: When people like your appearance, they'll be eager to hear what you have to say. There is no point looking good, if the moment you open your mouth, people will run for the hills. In this generation where we all lean towards using slang when we text and speak, it is easy to get carried away with our slang while speaking to professional individuals. Drop the slang! Practice speaking to your friends using proper English. You can't be speaking to a CEO and say things like "that is so LOL" No! not acceptable. Speak properly; now bear in mind that proper doesn't mean you should speak in a fake accent. You'll come across as stupid if you studied in India but happen to have a British accent. Speak properly by using the right words, the right tenses, avoiding slang and pronouncing your words clearly. Don't Over-do It: Some people are so eager to make a good first impression, they end up falling all over the place. If you are trying too hard, you may end up failing miserably. Don't drown the people or person you are trying to impress in the constant droning of your voice. Don't go on and on, without letting others get a word in. I understand that sometimes, we are so eager to cement the connection, we want the person or people to know all the good things about us in one afternoon. Going on and on about yourself will do little or nothing to help you. If anything at all, it may convince the person you're trying to impress that you're an annoying and obnoxious fellow. Nobody likes that. Relax: This is key to making a good first impression; look comfortable, dress comfortably, act comfortable. Smile, laugh, ask simple questions, listen to responses and build your conversations based on them. Don't try to dominate conversations; it is not a good first impression. Also, don't play out conversations in your head, and simply go on a tangent, irrespective of what the other person is saying. Listen to other people and build the conversations based on that. Avoid being conceited and self-centered. If it's a networking session, then you want to ask questions about the program or company, you want to talk about what you expect to achieve and most importantly, listen to the other person.